Right from the outset, iPhoto helps you organize pics so that you can more easily find the ones you want to view later. All the imported pictures are stuffed in the iPhoto library, which you can easily access by clicking Library in the source list at the upper-left side of the screen. Your entire image collection shows up in a grid of thumbnails, or mini-pictures, in the main viewing area on the right. If you’re having trouble seeing those thumbnails, drag the slider at the lower-right corner and watch the thumbnails grow. Now suppose that you want to display just the pictures you took around the time your little angel was born. Click the calendar icon at the lower-left corner of the screen and scroll to the month and date in which you want to display pictures. You can scan for pictures in your library taken during a specific period by dragging the scroll bar on the right edge of the iPhoto screen. As you do so, a floating translucent panel called Scroll Guide appears in the middle of the window, showing you the date and (depending on preferences) title of each film roll. Keywords may be the key to finding pictures in the future. These are labels, or tags, applied to a set of photos. Apple provides some keywords right off the bat: Favorite, Family, Kids, Vacation, and Birthday. 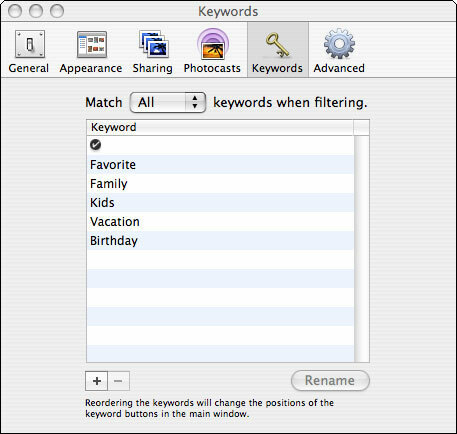 You create your own keywords by selecting the Keywords tab under iPhoto Preferences (see Figure 1) and clicking the + (Add) button. Figure 1: The key to keywords. Above the list of keywords is a check mark. Its purpose is to flag all the photos you may want to pull together for a specific project. The check mark shows up in the lower-right corner of a thumbnail on selected images. 1. Select the specific picture. 2. Choose Photos –> Get Info. 3. Make sure that the Keywords Tab option under Get Info is highlighted. 4. Place a check mark next to the keyword (or keywords) you want to use for the image. As an alternative to Steps 2 to 4, open the keywords pane at the lower-left corner of the screen by clicking the button that looks like a key. Drag the photo onto the appropriate keyword. Choose Photos –> My Rating and click the number of stars you have in mind. Open the Information pane by clicking the little circled i button near the lower-left corner of the screen, and then click the representative dot next to Rating. While holding down the Command key, press the 1, 2, 3, 4, or 5 key (representing the number of stars) on the keyboard. 1. Choose File –> New Album, or click the + button at the lower-left corner of the iPhoto screen. 2. Type a name for your album (Hawaii Honeymoon or Dance Recital, for example). 1. Choose File –> New Smart Album. 2. Type a name, just as you do with a regular album. 3. Select the conditions that must be met for pictures to be included in the Smart Album. In the main viewing area, photos are displayed in the order in which you imported them. If you want to change the order, choose View –> Sort Photos, and then choose an option, such as By Film Roll or By Rating. Under the View menu, you can also decide whether to display the titles, keywords, film rolls, and ratings of your photos.